At some point in your planning career, you fall behind. You forget to write down your to-do list, you didn’t fill out your habit tracker, or you forget to check your schedule. 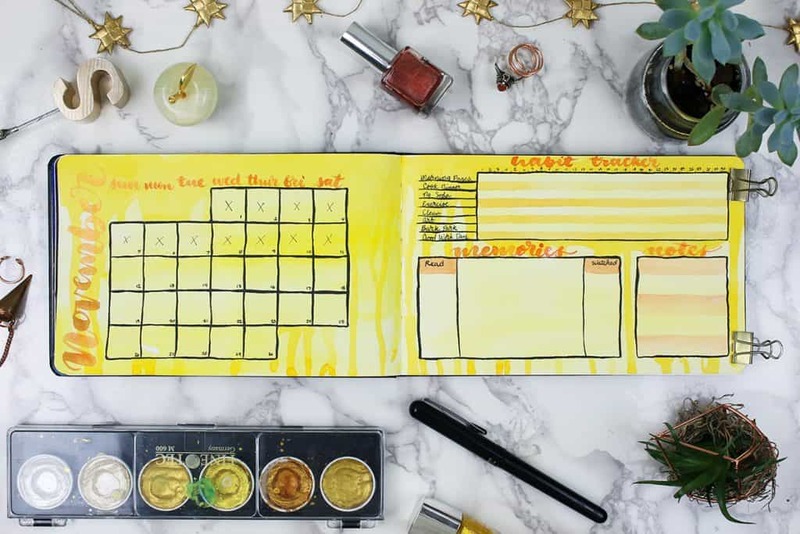 One thing leads to another, and suddenly it’s been weeks or months since you cracked open your planner and followed your organization routines. It happens to everyone. As each day passes, it gets harder and harder to jump back into planning. You begin to feel terrible for falling off the wagon, and your negative feelings start to get in the way of productivity. You want to go back to planning and stop the mad scramble that your life has become, but it’s so difficult to get back into the groove. So what do you do? I’ve been dealing with this myself lately, and it’s not a fun feeling. After painting, filming, and editing every single day for A Month in Color, I was exhausted and needed a break. That itself is fine – it’s great, in fact, because taking a break is sometimes necessary for your mental health. But after I had a nice long weekend away from my planner and blogging duties, I just couldn’t start again. I wanted to jump back into planning so bad, but I kept putting it off until tomorrow. This went on for nearly two weeks before I decided to put my foot down. While two weeks might not sound like a long time, you’ve gotta remember that I also make my living from this blog – which is largely about planning. My income is tied to this part of my life, so two weeks is too long. There are a lot of factors at play when you struggle to jump back into planning. 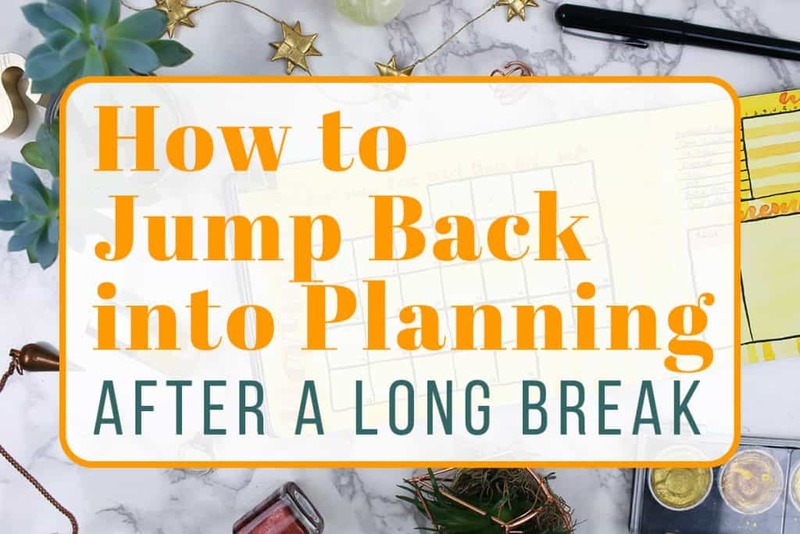 Let’s explore what might be holding you back from getting your planning mojo going again. I don’t know about you, but I’m a pretty delicate creature when it comes to my routines. I have very specific routines set up that are tuned to my maximum efficiency. If one little thing gets pushed out of place, the whole equilibrium comes crashing down. Usually, my planner (especially my habit tracker) is my rock in helping me get through that sort of disturbance. But when my planner is the part of my life that’s out of orbit, then I’m royally screwed until I get it back in place. That’s one of the biggest reasons why I take so long to jump back into planning after I’ve been on break for a while. I need to get momentum going again. When you stop planning for a while, it’s easy to start thinking negative thoughts about yourself. There’s a nasty little voice inside that makes terrible remarks about your abilities as a professional/parent/spouse/student. Why start when you are only going to fail again? What’s the point of trying if you’re so awful at everything? That voice can eat at you and cause you to wallow in self doubt, making it so much harder to start again. As each day passes, you have less and less thoughts that say, “Hey, I should grab my planner!”. You get further adrift in the flow of life and forget how much nicer it was when you had an active planner. Chaos becomes normal, you begin to get accustomed to the mad scramble you experience every day. You occasionally remember your planner, but it’s always at the most inconvenient times and you totally forget when you have the time to do something about it. You just forget again and again to go find your planner and rediscover organization in your life. 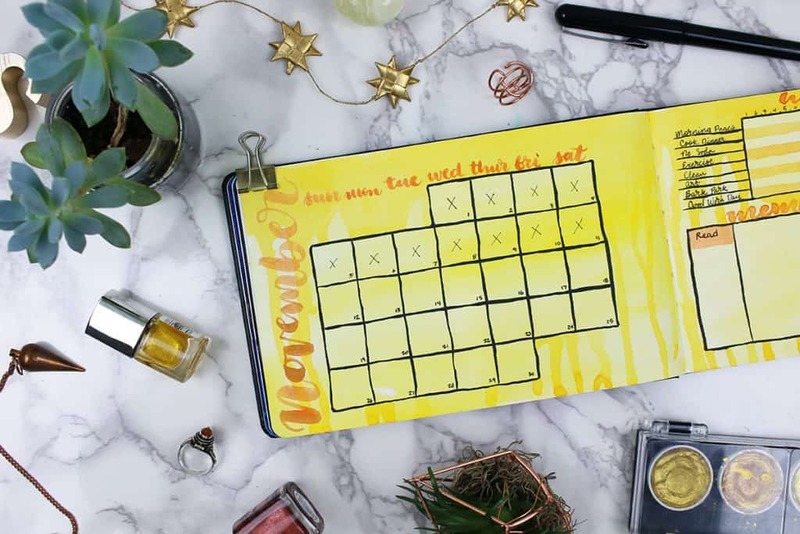 As you may know, I create a monthly set up every month to keep me organized and track all my information for the month. For November, I just… didn’t. I went about my daily life, struggling to reconnect with my productivity in a consistent, meaningful way. Sure, I had short bursts of productivity, but for the most part I was at a loss. After some reflection, I realized that it was because I hadn’t set up my November monthly layout. I’m so used to framing my whole month in my planner that going without it meant that I was mentally in the wrong place. So I decided yesterday to sit down and just do it. I hesitated to take the time to do it because of the aforementioned self doubt. I feared it wouldn’t help me with this planning funk, or that I would waste precious time working on it. So I told myself that I would keep it simple. No crazy designs, no big decisions on colors, no new elements at all. Just the basics. Done not perfect. Once I committed to setting up this monthly spread, even though I was two weeks late, I felt myself getting absorbed into the project. As soon as I got past the first step of penciling out the boxes, the feelings of anxiety and doubt were gone. I chilled out listening to some Ella Fitzgerald and let myself enjoy the process. By the time I finished, I felt much, much better. I reconnected with my planner in a very real way. For me, it was just a matter of sitting down without time restraints or high expectations and just enjoying the process again. The best way to get back into your planner is to just sit down and do it. 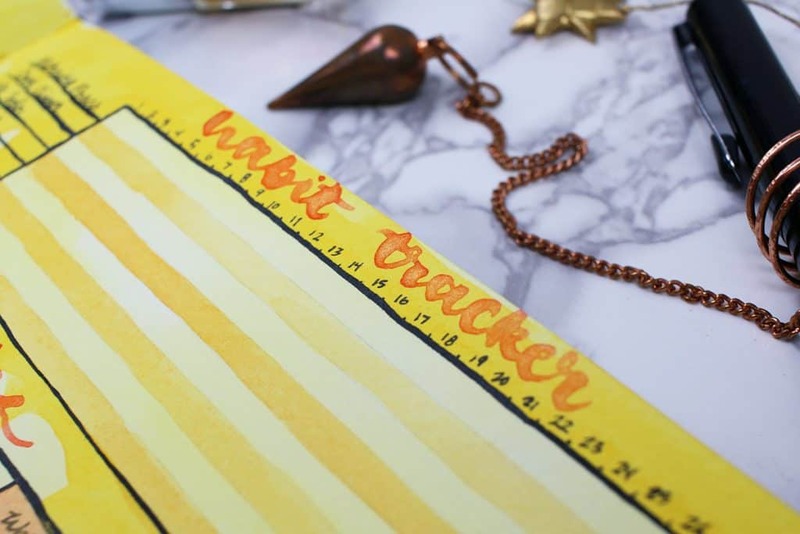 Block out an hour or two to be alone with your planner and keep things as chill as possible. I’d highly recommend you turn on some medium to low energy music to ease into the mood. I listen to Prime Music, which is ad free and filled with amazing music. You can try it free for 30 days and get all the other perks that Prime members enjoy, like 2 day free shipping (which is essential for life at this point). Along with music, make sure to grab something comforting like a cup of tea or a latte. Settle in and wear your favorite socks. Light a candle. Do anything and everything you can to remind yourself that this is not a chore, but something you actually enjoy. Then think about what, if anything, is stuck in your craw. For me, it was the November monthly set up. For you, it might be simply picking up on dailies again. Or it could be that you started getting bored with your planner. Whatever it is, just face it head on! Do that thing you’ve been itching to do. If your planner is too boring, spice it up with fun new pens or watercolors. If it started getting too over the top artsy, dial it back with a more minimalist style. Try writing a list of what stuff you’d like to work on and pick one thing to focus on today, or even go for a List of 100 if you’re feeling frisky. Then just start. You don’t need a bunch of prep for this one. Right now, you just need to break through and get back into it again, even if it’s not perfect. In the end, don’t stress about your planner too much. 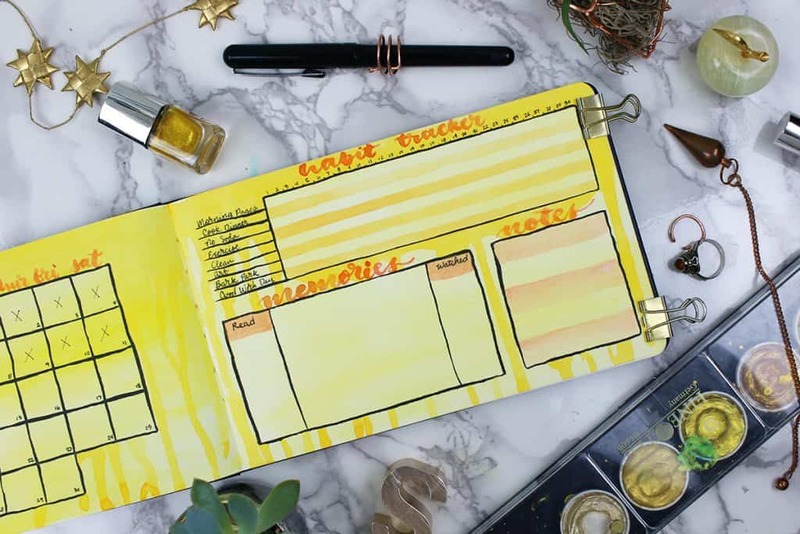 Everyone has off times where they just lose their planner mojo – even me, and I’ve been at this for years. You aren’t a terrible person, you aren’t sloppy and lazy, and you aren’t abnormal at all. When you’re ready to jump back into planning, you don’t need any fancy techniques or methods. Just try to identify what is holding you back and face it head on in the most relaxed manner possible. Force yourself to sit down and work with your planner, but don’t be a hero. Take baby steps to get back into your habits and make it work. Keep in mind that this part of your is something you want and enjoy, not a life-or-death situation. Take a breath. Say an affirmation. And remember that it’s just a planner. This is so encouraging! Helps me to know im.not alone in my struggle to get back on track. I completly understand the being disturbed factor. I need to put up a better shield and use my calendar blocking more. Thank you! Glad to hear you are feeling better Lala! Thank you for reading! A great post, which I can certainly relate too. I love the way your writing takes such a holistic approach, going way beyond the bullet-journaling itself and touches on subjects such as self-doubt. Thanks to being inspired by your blog, I have started a bullet journal myself. Did really well for three weeks and found it very helpful, but have slipped over the last five days or so, due to a disturbance in my routine. I am now motivated to pick it up again and get my thoughts together! So glad to hear this was helpful for you Amanda! Thanks, your posts have seriously helped me move forward with calendar planning again. That’s so great to hear, Aspen! Thanks so much. This post hit home. I’ve been so busy that my planner has been neglected. I also think about setting up my 2018 planner but I am overwhelmed on where to start, so I seem to be in a holding pattern, just going in circles. I hope this post helps you find a starting point again, Trish! Gosh, I’ve been thinking so much about this during your Month in Color, because I identify with the feeling of excitement at the start of a project, and how it peters out after a while. Like you said in a few of your videos, that’s when you can force yourself to continue working, push through and make some real progress. I agree – to a point. Just my two cents, but I think you were right to take time off after October. Even though it can feel distressing and confusing not to follow your routine, I think sometimes our brains just need to switch off, especially after a huge project like that. Then of course you need to get back on track, just like you’re saying here. Thank you for sharing your perspective, Ingela. Needed this just before things get out of hand. Sometimes I feel in control and other times not so much! Glad to know you have moments too. November has been a BUJO slump for me as well. It took a week to get the intro page, I had a stamp to use specifically for November…. Well here I see your post title and went, “how did she know?” Too funny. So I’m going to get my shower and then sit down with my BuJo and get at it. It seems to be the case for a few people! Here’s to getting back at it! Shelby – thank you for being honest and real with your posts. From someone who falls off the planner wagon more times that I would like to admit, it is comforting to know that I’m not the only one who falls, and that I don’t have to beat myself up over it when it happens. Sometimes confirmation of that from others is just what I need to see. Yes! We just have to get back to it and keep moving forward. Hope you have a wonderful week as well. Just curious: what is that copper colored doodads on a chain between your planner and pen in the photograph of your November spread? And I loved this pep talk! Must have been something in the air, because I fell off the planner wagon, too. I’m so glad you liked the post, Kaethe! That’s a little copper pendulum that I have lying around! It pretty much lives to be a photo prop 😀 but it sure is pretty, isn’t it? This is so something I needed to read right now. I’ve been feeling so blah about planning because I don’t have as much going on as I used to, but I find things falling through the cracks because of it. Thanks for the motivational post!! Glad to hear! I am right there with you! You’ve inspired me to get back to exercising and stop making excuses. I’ve fallen off the wagon and used every excuse not to get back on. After reading this post, I’m ready to just do it. No excuses, nothing too big, start out small and then my love for running will return. Can’t wait to be reacquainted with it again. Thanks Shelby for the motivation. I am so happy to hear this has motivated you! 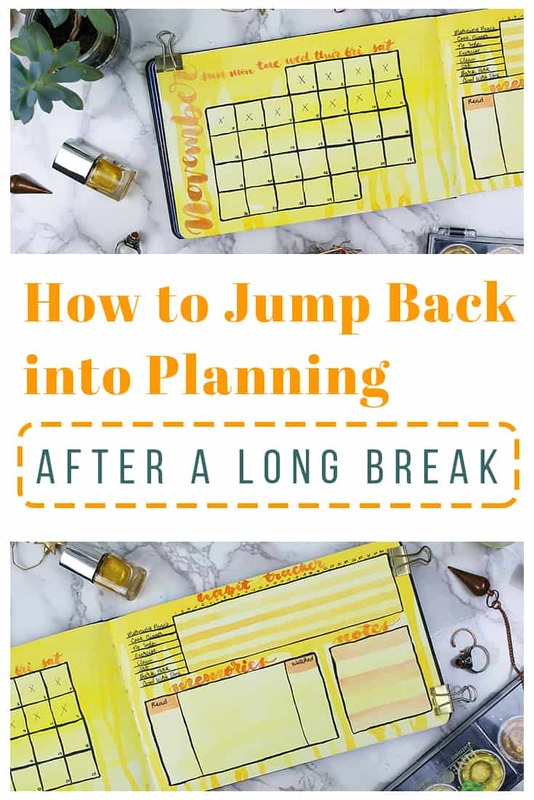 This post could not have come at a better time, I have been desperately trying to force myself to pick up my planner again (it’s been a whole month whyyyy) and this was so helpful and encouraging, thank you! So glad it was timely for you Kenna!